Accessories: Accompanied by Patek Philippe Certificate of Origin, Patek Philippe winding box, presentation box, additional sapphire caseback, adjusting tool, leather wallet and product literature. Patek Philippe reference 5039 was launched in 1996. This complication features a perpetual calendar with leap year indication, a 24-hour indication and a moonphase. Cased either in yellow, white or pink gold, the bezel is further decorated with hobnail finish, also called “Clous de Paris” in French. This decoration further enhances the architectural effect of the case. Interestingly, even though the 35.5mm case diameter may seem small, the watch offers a great wrist presence and remains very contemporary. This elegant "black tie" type of watch is part of one of the most exclusive timepieces from Patek Philippe as it is a perpetual calendar. 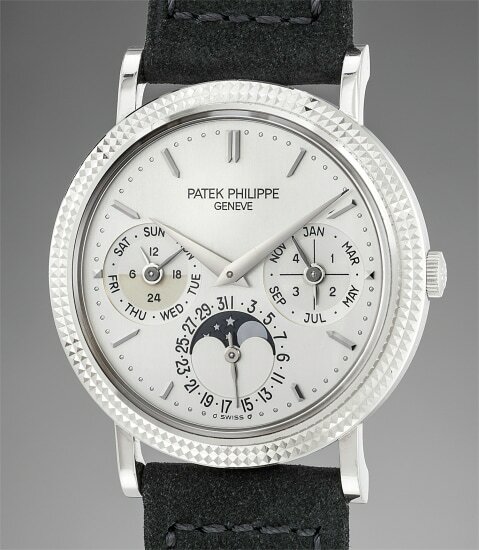 In 1941, Patek Philippe launched the first serially produced perpetual calendar wristwatch. Since then, the references have evolved, adapting their design to the trend and accommodating new features such as leap year or 24-hour indication. The present white gold perpetual calendar is a true connoisseur timepiece. It is offered today in excellent condition and comes complete with its extremely stylish burgundy winding box, an additional sapphire caseback, the original Certificate of Origin, product literature and even an additional fitted presentation box.